If you are looking for a guide on how to keep bugs away then you are in the right place. Keep reading for 15 great natural ways to keep bugs away. Bugs are a bug nuisance. Bugs bite and can also carry diseases. The good news is that are many natural ways for you to keep bugs away. There are several plants that can help you with keeping bugs out of your home and yard. You can plant these in a small pot to keep in the sill of the window. You can also plant them in your existing garden if you have one. These plants will help keep away bugs as well as provide you with fresh spices which you can use for cooking. Plants emit aromas that help to repel bugs. They simply don’t like the smell and therefore tend to avoid these areas. Choose to plant these plants in areas that make sense. If you are having an issue with bugs on the patio then you should position then in this area. You can plant a small amount of any of these in a pot. Then set the pot out wherever is necessary in order to achieve the best possible results. Also, you are able to use as many of these as you’d like. The more plants you use the happier you will be with the results that you achieve. Another way to keep the bugs away to change out your existing light bulb. The majority of bugs are attracted to light, therefore you will often see them swarming around your light. If you are wondering how to keep bugs away from the patio then LED lights can be helpful. It has been found that using a yellow bulb or an LED bulb can aid in preventing the bugs from swarming. These types of lights will not attract bugs in the same way traditional bulbs do. This is also a fairly affordable option. Think hard about the areas where you notice the bugs swarming the lights. Select areas that you frequently use and then change out all those lights with the new ones. Lemon eucalyptus works similar to DEET. The benefit that you get from the lemon eucalyptus is that you are able to avoid the harsh chemicals. You just need a small spray bottle and water to mix with the oil. You then spray this on either furniture or clothes. While this does work well at repelling bugs you will find it does not last as long as the DEET does. Therefore, you need to reapply for often. If it isn’t hot outside you can also make sure you dress to cover as much skin as possible. This is great for short periods of time when you are outside socializing and want to avoid mosquitoes. You can keep the mixture if there is any left over. It will stay good and work for quite some time after you have made the spray. It is, however, best to store it in an area that will not get too hot. Another great method for how to keep bugs away from the porch is to use a fan. Fans actually help with keeping the bugs at bay in two different ways. First, they help by being able to dissipate the scents and secretions of humans, and this makes it difficult for these pesky little bugs to land on you. The second way that fans are helpful with repelling bugs is by creating a wind that is heavy. This wind helps in keeping bugs, like flies and mosquitoes, from entering the area. You will also benefit here because the fan will help you feel much cooler than you would likely feel otherwise. You can use a box fan, ceiling fan, or other fans to get the job done. If the area is large you should consider multiple fans at the same time. This helps to protect the whole section that you are using from flying insects. Citronella is well known for keeping bugs away. It can come in the form of oil or in the form of a candle. You can even use the oil and wax to make candles on your own at home. You need to make sure that you don’t use paraffin here. It is best to use soy wax due to the fact that paraffin has a high-density of hydrocarbon. Hydrocarbon can cause irritation to the eyes. Many people don’t mind the smell of citronella. You should be aware however that the smell can be quite potentate. You can make the candles yourself. This will allow you the ability to add other scents. You can use scents such as peppermint or even citrus. Adding these scents will help to make it smell more pleasing to you. Citronella has been used as a natural bug repellent for many, many years. It is sure to continue to be around as it really does seem to work effectively. Most bugs hate the smell of things that we like the smell of. This is good news for you. One of the wonderful smells that the bugs seem to hate is mint. Luckily for you, mint is great for repelling most insects and bugs. You can create your own spray using your favorite scents to repel bugs. Another option would be to use a little mouthwash. Once you have picked the type of spray simply spray over areas that need protecting. You will need to reapply after just a bit. You can reapply anytime you begin to notice that the effects are wearing off. Pomander is a great way for you to make your home smell fabulous while also getting rid of bugs. Get an orange, that is sweet in smell, and place cloves all over it. You can even make a cute little pattern. To make a pattern simply around the cloves decoratively as you place them in the orange. Now you just need to place in the areas where you are having problems. Finally, sit back and watch the magic happen. There are many other methods like this to repel bugs. Chances are you even have these things already present in your kitchen. You just need to know how to put them to work for your bug problem. Mint, cloves, cucumber, pepper, and chili powder all repel insects. Depending on the type of bug that you are trying to repel you may find that one works better for you. The cucumber needs slicing in order to emit the smell. So keep things like this in mind as you try different spices and foods to keep bugs away from home. You are likely to find that the best results are achieved from your fresh spices and foods. In other words, garlic powder is not going to work to the same degree as a clove of garlic would. Different smells repel different types of bugs. If you have a specific bug problem in your home then you should look to see which of these works best for you. If you want to extend the longevity of homemade insect repellent that you have made soybean oil is a must. It is a fixative in repellents made from home. You need to mix it with whatever essential oil you choose. Then just spray it on your clothes. When you need protection that is going to last and is great for outdoor activities this comes in handy. This is one of the easiest natural ways to keep bugs away, from your body at least. Layer your clothes with pants and long sleeve shirts. This is very helpful at preventing mosquitoes, which carry diseases. It may not keep them from landing on you but it will sure help inhibit them from being able to bite you. A venus fly trap or another type of carnivorous plants. These can be plants and placed around your yard to keep bugs away. It doesn’t help that these are also fun to look at, so it can double as entertainment as well. Do make sure that you understand how to care for these types of plants before you decide to buy one. Read more: What Kills Cockroaches Instantly? Ticks and chiggers are a huge problem, especially if you will find yourself in the woods. It is important to remember to put on repellant each time that you are in the woods. Applying repellant will help you to avoid getting ticks bites. Remember that ticks carry diseases, and you don’t want to deal with that. To help protect yourself simply rub the powder of this flower, also known as mountain mint, on your clothing. This will help with repelling any insects and is very effective. As always with repellents, you need to reapply as necessary. You can wait till you notice the effects wearing off to reapply. To ensure protection at all times you should go ahead and treat yourself regularly. To repel insects like flies and insects that bite you can use nepeta cataria. Other common names for nepeta cataria are cat-mint or catnip. If you will be using dried catnip you can rub this on your skin or clothes. You can even take a few sprigs with you, if you’d like. If taking sprigs, just place them anywhere on your person. Try placing them in your hat or even a pocket. The oil is able to be extracted from catnip in many different ways. You can use the essential oil to make a spray. Either method that you choose should be effective, and choosing is really more of a personal preference than anything. You can try both to see which one works best for you. The store will likely carry a few natural repellents. While these will likely work just fine, you need to take the time to look over everything. You want to make sure that everything they are using is, indeed, natural. Sometimes things claim to be natural but don’t necessarily only include natural ingredients. For this reason going ahead and checking for yourself is always to best. Finally, you should avoid wearing perfume or clothing that is bright in color when you will be outside for an extended amount of time. Hawaiian style shirts look fun and are great for a luau. However, looking and smelling like a giant flower might also come with a few drawbacks. Wasp and bees like bright colors and flowery smells. You need to remember to avoid these if you want to become less appetizing to these bugs. While avoiding bright colors and not wearing perfume will help keep bugs from being so attracted to you it is not going to stop them completely. For this reason, you should a method of repellent along with it. As always, it is important to make sure that you are also keeping things picked up and clean. Bugs need sources for food and water, you want to remove these sources when at all possible. This means get rid of any areas where there may be stagnant water accumulated. You also want to make sure that you are storing your food appropriately. This means that fruit and vegetables that are ripe should not be left out. All the containers that your food is in need to be well sealed. Doing these few things can make a huge difference warding off bugs, and they only take a few minutes. Most people just don’t realize that these things draw in as many bugs as they do. Now that you know all these natural ways to keep bugs away all you have to do is enact some of them. You still need to make sure that you are keeping all areas free of the things that can draw bugs in. 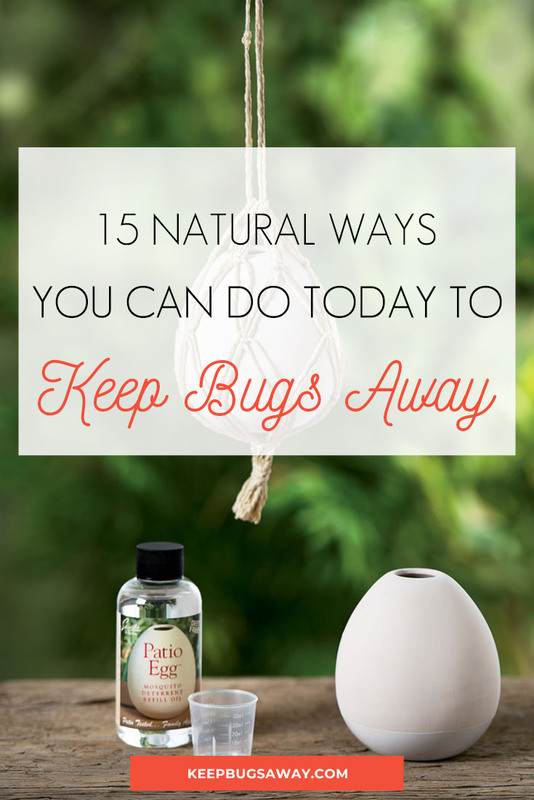 Enjoyed 15 Natural Ways to Keep Bugs Away? Share it with your friends so they too can learn how to keep bugs away.